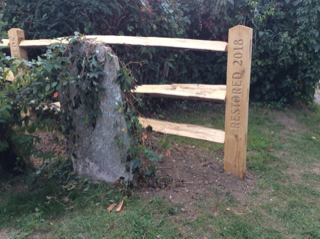 The Society held a celebration to mark the completion of the project to restore the fence in the Churchyard of St Peter’s Church, known as the “Church Marks”, on Saturday 13 October 2018. The lovely weather enabled fifty people, including generous sponsors, Society members and members of St Peter’s congregation to enjoy refreshments (served by Mary Wilson) and witness Father Martin bless the magnificently restored fence, as well as the restored footpath lighting (enabled by the Co-op Community Development Fund). The Church was also open for people to see the Godman Book, the Nelond brass and the “There but Not There” perspex figure sited at the front of the nave, which is representative of every name on local World War One war memorials around the country and donated by the Society from proceeds of the last Village History Day, held in 2014. Today, church marks are exceptionally rare and the restoration was essential if this historical fence was to survive through the 21st century as a historical record for future generations. 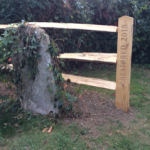 The origin of the Church Marks fence dates back at least three hundred and thirty years, quite possibly longer, and is thought to be found in an old Sussex Saxon custom to mark the boundary of a churchyard with fencing by farms and houses in the parish. The first mention of such a fence in Cowfold is found in the Parish Register for 1682. This historical entry records each landholder, their property and the footage they were responsible for by maintaining one panel of oak fencing on which the name of the farm or house was deeply incised on the post. The Society is most grateful to Barry Sowton for leading the Church Marks restoration project (with Sue Crofts’ valuable help) in such a short time span. A local artist, Penny Hopkins, has painted a map of the fence to be displayed in the Church Lych Gate so that the posts can be located. 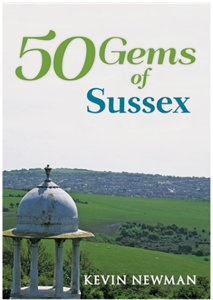 Our next meeting is the Annual General Meeting, followed by an illustrated talk by Kevin Newman on “The 50 Gems of Sussex”, on Friday 12 April 2019. The event will be held in the Almond Centre, 7:00 for 7:15 pm, with the talk commencing at 8:00 pm. Can you help identify these photographs from Horsham Museum? 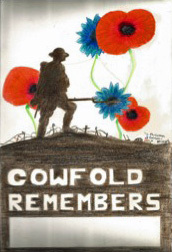 The images and text on this site are published in good faith, and are the copyright of the acknowledged owners of Cowfold Village History Society acting within its own right or with permission of donors and contributors. If anyone has a specific issue with an image or article, they should contact the society immediately so that the matter can be resolved. The Society reserves all its rights with regard to commercial reproduction. However, requests for the use of Society images in commercial publications will be given sympathetic consideration.